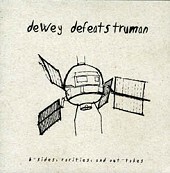 Spinning, bouncy, and guitar-laden rock with an emotional pull, Dewey Defeats Truman's aptly titled B-Sides, Rarities, and Out-Takes is a pleasant escape from the generic emo crap that every kid and their brothers are doing these days. Melodic, but fierce, piercing, but not over bearing, and catchy enough to hook you, Dewey Defeats Truman is a non-stop ride through jagged guitars, jarring drum beats, and crunchy bass. All of which will draw you into the songs and capture your attention before chewing you up and spitting you back out. Ah, the powers of good emo rock. I'll give it a B. Devoted Few, The: Sleepless Dewey Defeats Truman: The Road To Nowhere Maps E.P.